•0.5 lb boneless chicken cut into small slices. First step is to cook chicken. Heat a nonstick skillet over medium heat and spoon in 2 tbsp oil. When oil is hot, add chicken slices. Sprinkle some salt and black pepper on the chicken and mix it well. Then add little amount of water and cover the pan. After two minutes, stir the chicken and cover it again. cook the chicken thoroughly by stirring it often. once chicken is cooked, drain it and keep aside. Cooking chicken will take approx. 5-8 minutes. Take a large salad bowl and drop vinegar into it. Add garlic and ginger to the vinegar and keep it for 5-10 minutes. Add rest of the dressing ingredients into vinegar and whisk together. 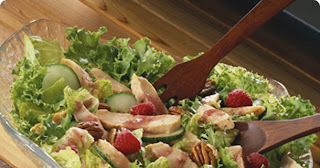 Now add the chicken and all other salad ingredients to the dressing and mix them well.